(《複数形》 音節pet・its fours 発音記号・読み方/petit fourz/)可算名詞 [料理名には 不可算名詞] プチフール 《小型ケーキの一種》. Borrowed from French petit four (字義どおりに “small oven”). A small cake generally eaten at the end of a meal or served as part of a large buffet. 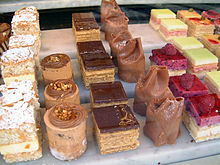 A petit four (plural: petits fours) is a small confection generally eaten at the end of a meal (e.g. with coffee) or served as part of dessert. The name is from the French petit four, meaning "small oven".